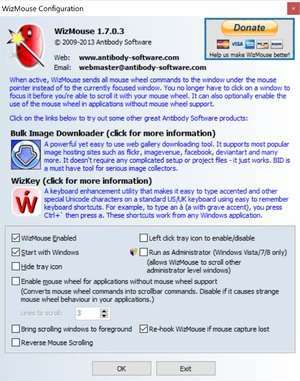 WizMouse is a small and free utility which helps improve the functionality of your mouse wheel. When you're browsing a web page or viewing a document, the program must be the foreground window. With WizMouse, it allows you to simply hover your mouse over the window in order to activate the mouse wheel -- you don't have to click on the background window in order to scroll with your mouse wheel. Essentially, WizMouse provides you the ability to change the function of the mouse wheel which is not native to Windows. Version 1.7.0.3 is a freeware program which does not have restrictions and it's free so it doesn't cost anything. For security reasons, you should also check out the WizMouse download at LO4D.com which includes virus and malware tests. Additional screenshots of this application download may be available, too. WizMouse has a presence on social networks.